We were planning to just do a conditioning exercise for the upper body only, but ended up with some leg work as well. Here’s the mini circuit that should take about 30 – 45 mins. Do each exercise for 20 seconds, then rest 20 seconds. Repeat for another 5 rounds. Reverse row on barbell or pullup rows on Equalizers. 3 mins, so that would be 20 seconds on, and 10 seconds rest for a total of 6 rounds. 20 seconds for each exercise, then rest 20 seconds, and repeat 2 more rounds. 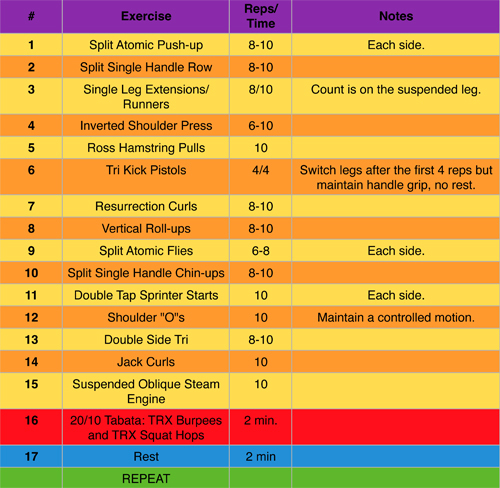 A awesome TRX workout from Chris Fales. Give this a go, and let me know how you do with it!